Note: A version of this post was originally published in in The Monitor, a technical publication of the American Society of Safety Engineers' Industrial Hygiene Practice Specialty, in August 2015. Healthcare workers have the potential to experience a wide variety of occupational injuries. Under the Occupational Safety and Health Administration (OSHA) Healthcare Safety and Health Topics webpage, OSHA lists the following as potential hazards: blood-borne pathogens (BBP) and other biological hazards, chemical and hazardous drug exposures, waste anesthetic gas exposures, respiratory hazards, ergonomic hazards, laser, hazards, workplace violence, and radioactive and x-ray hazards. Chemicals such as formaldehyde, glutaraldehyde, ethylene oxide, peracetic acid, ortho-phthalaldehyde (OPA), and environmental disinfectants are sources of potential hazardous exposure for healthcare workers (OSHA, 2015). There is insufficient guidance for healthcare safety personnel to evaluate the risks associated with the use of these chemicals. Research evaluating the potential for synergism among chemicals used in healthcare that may adversely affect healthcare workers is scarce. The heightened awareness of infectious diseases such as Ebola and Middle East Respiratory Syndrome (MERS) has led to increased use of environmental disinfectants throughout healthcare and other workplaces. More research and expertise is needed by qualified industrial hygienists and safety experts to properly recognize, evaluate, and control the hazards present in healthcare. Despite the improved focus on patient safety, quality control and regulatory compliance, the injury and illness rate from healthcare workers are almost twice as high as the private industry rate. A news release from OSHA on June 25, 2015 explained that OSHA will be expanding enforcement activity in healthcare facilities. OSHA�s enforcement focus will be on preventable injuries, such as those from patient handling, BBP, workplace violence, tuberculosis, and slips, trips, and falls (OSHA, 2015). OSHA has developed resources, checklists, and guidance for healthcare safety relating to building a culture of safety, injury and illness prevention programs and/or safety and health management systems, infectious diseases, safe patient handling, and workplace violence. The National Institute for Occupational Safety and Health (NIOSH) has also developed resources for healthcare safety relating to hazardous drug exposures, waste anesthetic gases, and latex allergies. Additional guidance is available from accrediting organizations such as The Joint Commission, DNV Healthcare, and Center for Improvement in Healthcare Quality(CIHQ), among others. So, with all the resources and guidance available, why are the injury and illness rates so high among healthcare workers? Some safety and health professionals might argue that the healthcare organizations are too focused on patient safety as opposed to employee safety, in order to improve their ratings and popularity. To combat this belief, The Joint Commission developed a monograph entitled �Improving Patient and Worker Safety: Opportunities for Synergy, Collaboration and Innovation� that explains the methods of coordinating quality improvement activities that will benefit both the patients and the workers. In the Foreword of the monograph, The Joint Commission explains that: �The organizational culture, principles, methods, and tools for creating safety are the same, regardless of the population whose safety is the focus. In fact, the same principles, methods, and tools may be separately used by different groups (clinical, human resource, and general liability personnel) within an organization� (The Joint Commission, 2012). This is not a surprise to healthcare safety personnel who came to the healthcare industry after training in other industries, but may be a pleasant discovery for healthcare safety personnel who were promoted into their position from other clinical or non-clinical jobs. There is variability in the tasks performed by healthcare safety personnel. Depending on the size of the campus or healthcare organization, healthcare safety personnel may have many other responsibilities beyond occupational and patient safety. Some healthcare safety personnel serve as the Director of Materials Management, Director of Facilities, Risk Manager, or Director of Infection Prevention, and the safety management aspect of their job is only a small portion of their daily responsibilities. Others may also serve as the Compliance and Privacy Officer, Radiation Safety Officer, Laser Safety Officer, and other technical and regulatory required positions. Healthcare safety personnel usually serve on a facility�s Environment of Care (EOC) Committee, which is an interdisciplinary team tasked with managing a facility�s physical environment in six functional areas: safety, security, hazardous materials and waste, fire safety, medical equipment, and utilities. The EOC Committee should have representation from clinical staff, security, healthcare administration, biomedical engineering, facilities engineering, infection prevention, employee health, laboratory, and other areas such as research administration that may be applicable to the facility. In reviewing the job tasks and requirements listed previously for healthcare safety personnel, it quickly becomes apparent that individuals holding a Certified Industrial Hygienist (CIH) or Certified Safety Professional (CSP) designation already have much of the required knowledge, skills, and abilities. Individuals with CIH/CSP designation who have not worked in healthcare before may need to learn more about BBP and infectious diseases, hazardous drugs, medical terminology, ionizing radiation, patient safety, laboratory safety, and the accreditation process. Having a qualified, certified, and well-trained person at the helm of health, safety, and environmental compliance activities may help healthcare facilities to improve their overall culture of safety � both for patients and employees. In an informal survey of hospitals located within Arizona, 23 hospitals were awarded an �A� or �B� designation by the Hospital Safety Score method in June 2015. After those hospitals were identified, a search of LinkedInprofiles was conducted to evaluate whether the hospital had a qualified and trained safety and health professional serving in a healthcare safety role at the facility. If the individual held a professional certification such as CIH, CSP, Certified Healthcare Safety Professional (CHSP), Certified Professional in Patient Safety (CPPS), orCertified Healthcare Protection Administrator (CHPA), it was noted in the survey. If the individual had also completed a master�s degree in safety, environmental management, business administration, healthcare administration, or other applicable degree, it was noted in the survey. The size of the hospital � and associated complexity of environmental health and safety management � is indicated by the number of licensed patient beds. 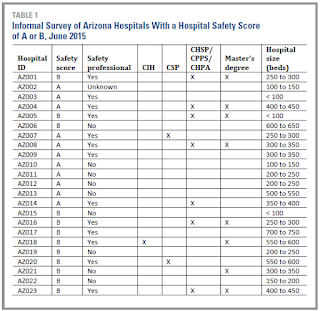 Table 1 details the results of the informal survey of Arizona hospitals with a Hospital Safety Score of �A� or �B� � identifying details such as the hospital name and actual number of licensed beds have been replaced with an identification number and a size range. Hospitals included in this survey range from small hospitals with less than 100 licensed beds, to large hospitals with 700 to 750 licensed beds. If the individual serving as the �safety officer� did so in an ancillary capacity (i.e., job title was Director of Facilities), and did not have any formal safety training documented in their LinkedIn profile, the �Safety Professional� selection was �No.� If the individual performed safety functions as the primary role, the �Safety Professional� selection was �Yes.� An �X� indicates that the individual held the professional designation and/or had a relevant master�s degree. The data from this informal survey has been summarized into Tables 2 and 3 below. Table 2 shows the number of Arizona hospitals with a �Safety Professional� (e.g., a �Yes� answer) as compared with the number of Arizona hospitals with a person who acts as safety officer in addition to their other job duties (e.g., a �No� answer). 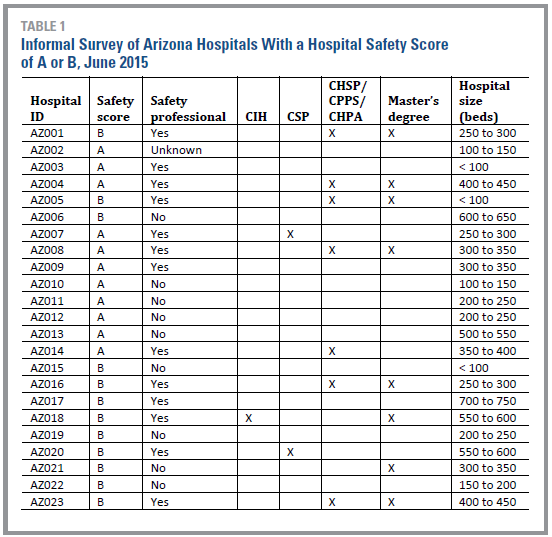 Table 3 shows the number of Arizona hospitals with a �Safety Professional� holding a CIH/CSP, CHSP/CPPS/CHPA, or relevant master�s degree. The hospital size ranges associated with these trained professionals is also provided in Table 3. Of the 23 Arizona hospitals with an �A� or �B� rating on the Hospital Safety Score site in June 2015, 13 (56.5%) had a dedicated safety professional. One of the smaller hospitals (AZ002) was not able to be included in the survey results due to the lack of information about the hospital�s safety officer responsibilities and lack of presence on LinkedIn. Of the 13 dedicated safety professionals, 10 (76.9%) had obtained a professional level certification or relevant master�s degree. 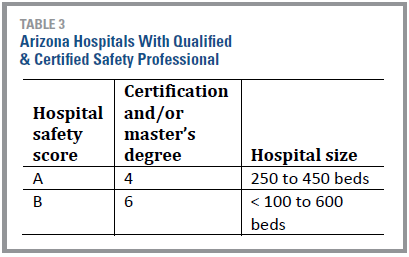 Hospitals employing these trained and qualified safety professionals ranged from small (<100 beds) to large (600 beds). Only 3 (30%) of the trained and qualified safety professionals held a CIH or CSP designation. The remainder of the certifications (70%) were from organizations such as the International Board for the Certification of Safety Managers, the Certification Board for Professionals in Patient Safety, and the International Association for Healthcare Security and Safety. Although only 10 (43.5%) of the 23 Arizona hospitals earning an �A� or �B� rating on the Hospital Safety Score site had safety and EOC responsibilities performed ancillary to the individual�s other job responsibilities, many of the hospitals represented in this informal survey are part of regional health systems spanning multiple states. These health systems may have regional or corporate level occupational health and safety personnel who serve multiple healthcare campuses and provide technical support to the facility-specific staff. As part of the �Improving Patient and Worker Safety� monograph, The Joint Commission listed several topic areas for targeted interventions with the goal of improving safety. Individuals with CIH/CSP designation that are looking to foray into the world of healthcare safety should research strategies, solutions, and benefits associated with this list. Healthcare systems looking to hire safety officers, safety managers, and directors of safety are looking for healthcare-specific knowledge that is difficult to obtain if you have never worked in healthcare before. An abbreviated and modified list of these topics is included below (The Joint Commission, 2012). Qualified industrial hygienists and safety professionals are needed to take healthcare safety to the next level. With OSHA promising to increase enforcement action, and accreditation agencies like The Joint Commission requiring documented improvements in safety and quality measures, opportunities for solution-oriented and collaborative safety professionals are becoming available. Industrial hygienists are needed to evaluate acute and chronic exposures to workers that may be inadvertently passed on to patients. Safety experts are needed to bring the industry knowledge from manufacturing, aviation, power generation, and other high-risk industries into the healthcare arena. As Dr. David Michaels, Assistant Secretary of Labor for Occupational Safety and Health, said in the news release from June 25, 2015: �[�] it�s time for hospitals and the health care industry to make the changes necessary to protect their workers� (OSHA, 2015). Let�s accept this exciting challenge and improve safety for all of the people that enter into, or are employed by, healthcare facilities.